First thing I noticed is that spaceship being held by the third Ninja Pig.. It kind of reminds me of the opening scenes of Kung-Fu Panda, where Po is playing with his Furious Five action figures. A gobbler batman and ninja pigs playing with toys? Hmmm... sounds interesting at the very least. We go to Mooshu for the prequest of Empyrea. Maybe we're going to Mooshu to inform the Emperor about a meeting held by the Council of Light about the emergence of Empyrea. Word has already on the lose about this world in the sky, that's why the Ninja Pigs are playing with sky-themed toys. (The Spaceship, Sky Squid? On the table.) They could be possible Mobs in Empyrea. Otherwise, Like Star Edward said. The toy laying on the corner of the table looks like Ione Virga!? the point of a teaser is to give you a small taste and not give the entire story. imagine looking at the cover art for book and instead of the art there is the entire plot spelled out for you. That small action-figure by the blue pillows looks like Ione. Dr. Katzenstien's Monster meets a Krokotopian Mummy? The A* (Avalon, Azteka, Aquila) Team? Street racing in Marleybone, The Fate of the Furry-ous? MI6's (Marleybone Intelligence) Agent 007, James Bone? totally excited about this world!!! I can't take full credit for this as someone mentioned some of these things on Twitter but the spaceship is the Arcanum, the second pig is holding the Bat, the sitting pig is holding one of those creatures that were shown in the Producer's letter. One of the dolls looks like Ione, the middle one looks like perhaps it's Mellori, the last one looks like Sohmer Sunblade to me but that could be coincidence. Finally the squid on the bench is a reference to the sky squids and the poster on the wall shows a Bird and a Tree and the Bird is singing which maybe refers to Bartleby and Grandmother Raven singing the Song that created the Spiral. 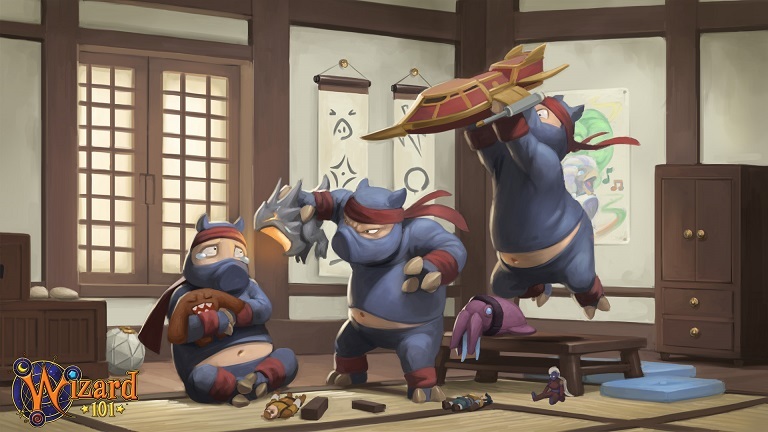 The secret life of ninja pigs.